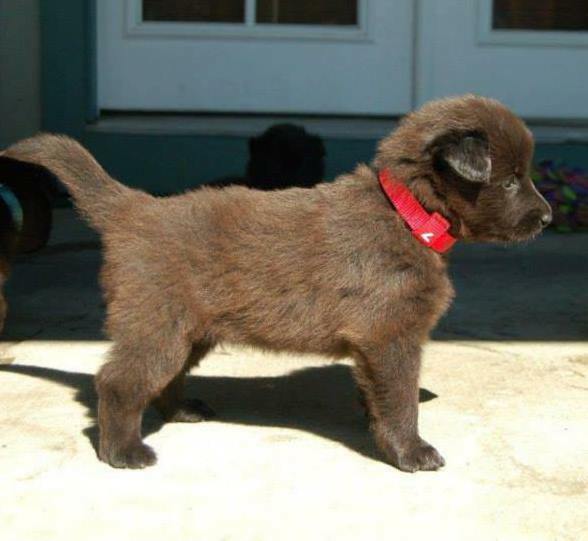 This puppy has been posted on a Belgian Shepherd color and coat forum on facebook for discussion on its color. I don't know the breeder or who owns it. 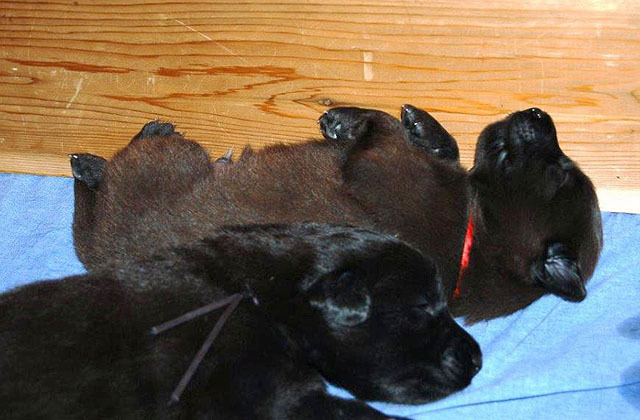 While coat reddening is not at all uncommon in Belgian Groen puppies, usually they are born black and the red tips may develop later (like sun bleaching on a black horse)- usually at 8-12 weeks. And after the puppy coat blows they go back to being normal black dogs. 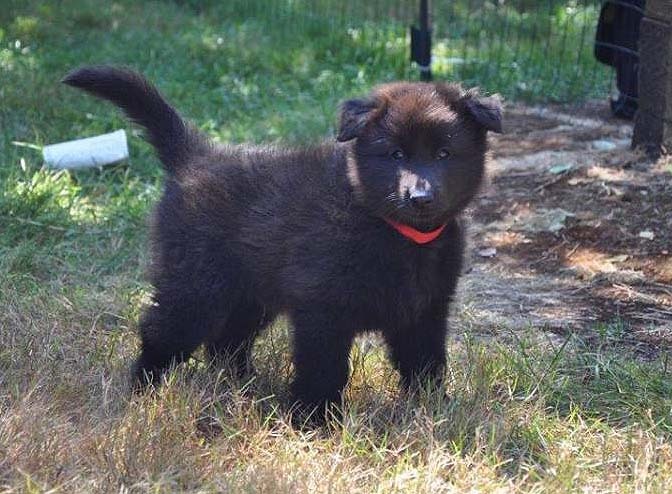 Most unusual, this puppy was born a very dark chocolate color (but not typical Tervuren Sable based red either) and there was some debate about its color. I initially suspected that it might be seal, as it had dark black pads and nose, and even a mask. However now it is about 8 weeks old and does not look seal any more. It looks to just be a very odd black. Both parents are typical dominant black Belgian Groenendael I am told. The puppy in question is the red-tinged one. UPDATE: New info just coming out from someone that knows the breeder of this litter that the puppy was actually born black, and developed the red tinge at about 10 days old. They said some of the other pups also get a little bit red colored, but not as noticable as this one. They are suspecting it was diet related. I'm not 100% sure I am buying that, but who knows. New info just coming out from someone that knows the breeder of this litter that the puppy was actually born black, and developed the red tinge at about 10 days old. They said some of the other pups also get a little bit red colored, but not as noticable as this one. They are suspecting it was diet related. If this is indeed the case I would be very suspicious of dietary deficiency, especially copper. Otherwise it looks like a mild dilution. Very interesting! Like many breeds the Belgian Shepherd used to come in many more colors than what is considered acceptable by show standards today. Today's standards only allow black long hair (Groenendael), sable and 'gray' long hair, short hair and wiry coated (Tervuren, Malinois, and Laekenois respectively) (all should have black mask and blackening on the tips of the body coat). The Belgian Shepherd breed is known to carry both dominant black and recessive black. Occasionally outcrops will arise in the breeding of two dogs that fit within standard colors. Black and tan, blue (in the case of sable dogs only effecting the mask), and it would appear seal. 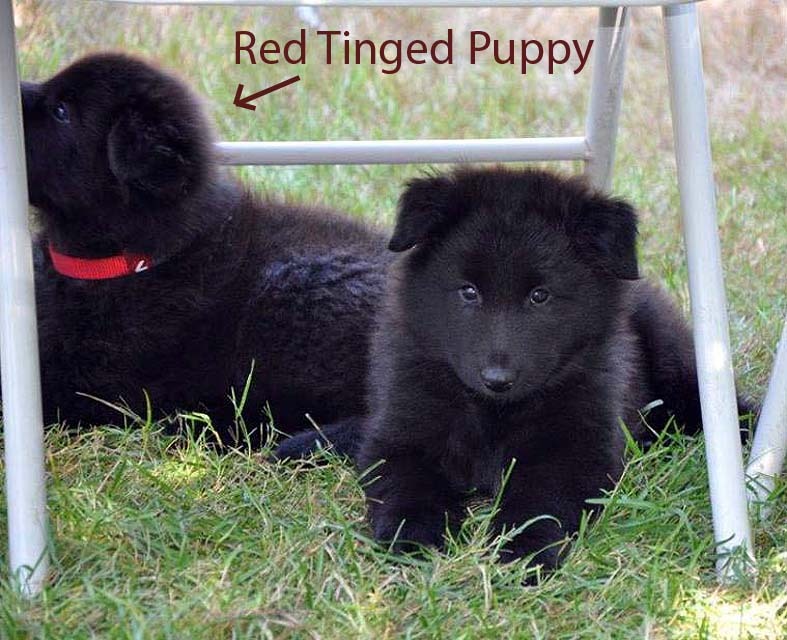 Some recessive black dogs also have tan spectacles (same as Finnish Lapphund "Bear Black" color most likely). Of course whenever these off color puppies arise people start screaming of crossbreeding occurring, however it is not inconceivable that they are either throw-backs to the days when the breeds allowed more colors, or mutations. All of the following dogs are registered as purebred Belgian Shepherds in thier respective country. "Seal" appearing long-haired dog. This dog was successfully shown as a Tervuren to it's AKC Championship. She had one litter, in which two of the puppies were the same color as this dog and two were regular Tervuren (with heavy blackening). Owner says "Not seal. Very dark overall, but with patches that were just sooty fawn. The legs and dark areas looked kind of like seal, but other places on the dog looked typical black tipped fawn." If not seal, then what? Do we know what causes 'black' wolves with this type of color pattern? "Seal" appearing Malinois (two photos of the same dog) or same coat color as long-coated dog above. Again, If not seal, then what? Head shot is a recessive black long-hair born out of two Tervuren parents showing tan rings around his eyes. "Eico von der Simmeringer Haide (Ico von der Simmeringer Haide x Roxie von der Simmeringer Haide) - having these "eye glasses" around his eyes, light hair also on his feet and very light under coat." Otherwise black in color. Next a Malinois showing blue mask and blue ticking on body. He is Land of Ox's Ice Blue Demon. Lastly a blue long-haired. Came from Spain - unknown who the dog is or pedigree, but out of two Groenendael parents. As I stated on the wolf page my gut feeling for the the top and second coloration is that they are very dark aw. As to what would make them that dark? I have no idea. I would be interesting to see them tested for agouti. It's interesting that some of the recessive blacks have those tan circles. It would be interesting to see some of the those tested for agouti as well. The UC Davis agouti test now covers all 4 agouti alleles. I have had contact in the last week with two different people involved in completely different breeds who were curious about the possibility of black and tan pop outs in their breed. One was involved with Cane Corsos the other with American Brittanies. Is the black and tan photo and the blue photos yours? I would be interested in using them in a blog post if they are. Thanks so much for sharing some really neat colors! Sorry none of the photos are mine (both dogs are in Europe). I will go read the wolf info. Thanks for the reply. Perhaps also interesting, perhaps not, but it is not too uncommon for Belgian Groenendael puppies to exhibit a little bit of 'wolf black' type of pattern from 8-16 weeks old, which they later more or less outgrow. This is a puppy from a litter I had 5 years ago. Father of the litter is a Belgian Groen out of a Groen x Tervuren intervariety mating (in Europe) so he would be Kk ay-. Dam is a Belgian Groen without any close up Terv genes. In 7 puppies all are black (mother is most likely KK, agouti unknown). 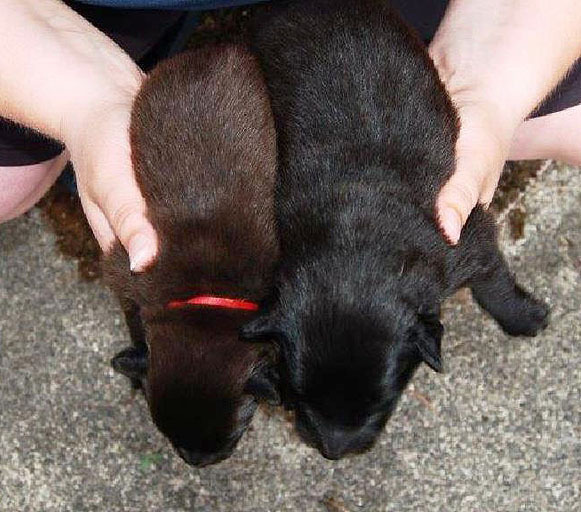 One puppy at about 9 weeks develops graying brown hairs in all of the normal 'wolf black areas'. As an adult at a distance he does appear more or less solid black (all guard hairs are black). However if you part the hair in the areas that were brownish as a puppy he still has a distribution of grayish brown hairs more than his littermates or mother). The photos show him as a puppy at 9-10 weeks and then as an 18 month old adult. In the head shot as an adult you can see that he still has residual brownish hair under the black undercoat. If he is Kk would ay possibly show through as this? Any other possible explanations? And this is a fairly common thing in Groenendael puppies. This puppy is a neutered male, but I could possibly get hair sample for testing, but what would I test for? It would only be for my own curiosity. Last photo shows a second, totally unrelated puppy, probably 12-14 weeks of age, showing similar pattern. Not sure what he looks like as an adult (well black at a distance, but not sure if he still had undercoat that shows this pattern like my puppy).